When it comes to adding appeal to your property, a patio installation will work wonders. As we contemplate our next landscaping project, we dream of time spent outdoors and what structure will provide the most comfort. A patio provides your property with versatility and character, allowing you to upgrade or enhance its appearance when you wish. 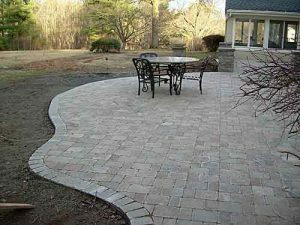 If you’re looking for a new landscape in your backyard, the opportunities are endless when installing a patio. If starting from scratch, or looking to knock down that deck and create a personalized structure, here’s why you should make the switch. Space and Design: All of our yards are different sizes. You can choose how big or small you want the installation, and the shape and style that it will encompass. Channel your inner creativity and create a shape that will make your home stand out for guests and neighbors. Incorporate curves or accommodate restrictions through the installation of a patio, and watch as your living space turns into a perfect space for entertainment. Plus, when the material is installed and you’re ready to enjoy your new yard, think about the décor that will truly make your patio stand out. Furniture, grills, bars, outdoor spaces and fire pits are commonly being incorporated into our outdoor spaces. Your designer can make an area for the fire pit, sitting wall or bar area, if so desired. Versatility: You are the designer, and you can make your visions come to life with a new patio installation. There is no design that can’t be completed, and you can be sure you won’t have the same pattern as your neighbors. Complement your yard with a patio that is versatile and eye-appealing. Easy Maintenance: No matter which material you wish to install—whether natural stone, concrete, pavers or brick, there will be minimal maintenance required for proper upkeep. 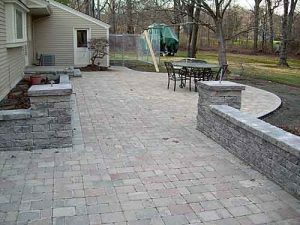 Pavers and stones require sanding the joints between units to avoid the growth of weeds, but much maintenance rests in the removal of debris and sweeping as needed. Durability: The sturdy material used to create a patio will stand up to the changing weather conditions, providing the durability you require. Their long lifespan and resistance to the elements make patios optimal for an outdoor living space. Durable on their own, adding sealer makes them shinier and sturdier, protecting them from the elements like precipitation and UV rays. Comfort: A quality patio installation adds comfort to your home. Stepping out the backdoor to relax on the patio is a peaceful and enjoyable setting. It’s the center of entertainment amongst friends, and a quiet area for wine and conversation. With the right design, your family memories will always involve an aspect of the patio, and how it enhanced your quality of life. Resale Value: When it comes time to sell the home, patios offer an appealing structure that increases the overall value of the property. If buyers like the design, shape and space of the patio, outdoor structures are a great selling point when looking at the details. With the aesthetic appeal of the material, and durability that is seen with patios nationwide, adding an eye-catching pattern will boost the resale value. A patio is often sloped and allows water to drain away from your home, protecting your foundation. Incorporate a natural look to bring out your personality and visions. Look at the trends for patio installations in your area, and know that you can be as unique as you’d like, no matter the material you choose. With all the benefits and appeal that is found in outdoor living spaces, the time to inquire about a new landscape design is now.